Standard - £44.99 Only 4 left! There's no denying that the fish-shaped gummy snacks are delicious. They're so delicious that others may try to take a bite out of you while you're celebrating Halloween in this Swedish Fish costume. Can you really even blame people? You are walking around a party dressed as a giant mouthwatering piece of candy so it's inevitable that a hungry party goer tries to take a nibble. In the case that someone tries to devour you, try your best to stay calm. Don't get angry because you DO look good enough to eat! Kindly explain to the overzealous nibbler that even though you look realistic, you are actually not edible. Their mouths will hit the ground when they find out that you're an actual person wearing a costume! 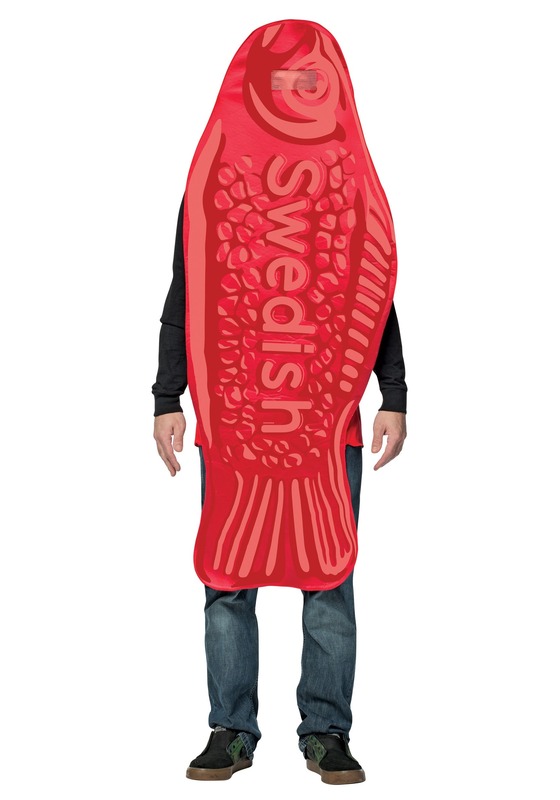 Now that you know the risk of looking like a lifelike gummy fish and you believe you're brave enough to fend off the potential snackers, then you need this candy fish costume. Put the red tunic over your head and pop your arms and legs through the appropriate hole. You'll be able to navigate any party easily because there's a mesh eye mask in the tunic which allows you to see out. If you keep our helpful advice in mind, we're sure that you'll get along swimmingly in this costume!